Monthly Happy Hour at local breweries or Restaurants that serve a variety of beers. for more information please contact Dan England. Due to all the Book lovers in our neighborhood we now have three (3) Book clubs. For picking our books, we have been relying on book club kits' from the library. A member will check out the kit, which includes 10 books. They will bring that kit to the meeting and pass out the books. The members then share these books over the next month - emailing the group when they are done, and passing them around. The books are due back to the group by the next meeting, where the process is repeated again! Has it been awhile since you've played bridge? Would you enjoy playing bridge again? How about an afternoon with friends, munchies, and a mental challenge? Bunco Groups are formed when 12 people have signed up. No skill necessary, it's all about luck and spending time with friends! Dinner Group is designed to get to know each other while dining on great food. The Group meets 4 times a year for dinner at the Club House. Menus with recipes are put together around a theme (Oktoberfest, Holiday Celebration, Mardi Gras & Summer Celebration). PCCL Members prepare a dish and contribute a nominal fee (usually $10 per person) to cover the cost of paper products/decorations/drinks. You don't need to be a gourmet cook to participate! 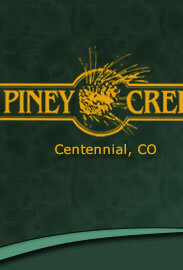 You try a new recipe (sometimes they are great & sometimes they are not), experience different food/cuisines & enjoy the evening with your Piney Creek neighbors. We knit baby items for charity “Warm Hearts Warm Babies” in addition to our personal projects. We meet every Thursday at 10:30 a.m. Sometimes we have to cancel. Sometimes we have group outings. Therefore, anyone who is interested should send me their e-mail to make sure they are informed about additions or cancelations. A gathering of ladies to network and develop friendship within the community. We will have a rotating calendar of activities but even if the activity isn’t one that’s your preference the basis of our get togethers is always bring your own drink and come mingle - participation in planned activity is optional! :) Laid back, low key and fun is what we are about! All ages, all background, all ladies are welcomed! We just want to get together and have a good time! Meets the last Tuesday of each month at 7pm. Open to both men and women. The group meets at the clubhouse the 3rd Friday of the month at between 7:00-7:30 pm and play starts at 7:30 pm. We play one or two standard Tournament style games per night with a $20 ante per game. This is a fun social event with the top few players splitting the winnings. Texas Hold’em is a flop-style game which features five community cards dealt face up on the table – aka, “the board”. All players can use these to create their strongest five-card poker hand, in conjunction with two private hole cards. We time and raise the blinds (minimum bets per hand) to keep the excitement and game rolling. Everyone is welcome to “bring your own drinks and snack to share”. REACH is the Piney Creek Community League's outreach committee that provides opportunities for members to volunteer or to donate to local groups of people in need. Currently, we are focused on two monthly volunteer options and occasional special events needing volunteers. Through the PCCL link, we will also alert members to needs that may be of interest to those who would like to support good work but haven't the time to volunteer. Monthly Theme Nights to discuss past and future adventures, travel tips, discounts and much more. Please contact Cynthia England for more information.